It goes with everything, never goes out of style, and is appropriate for all occasions. Not only am I describing the staple color in everyone’s closet, but I also happen to be describing a staple dietary lifestyle always in fashion: low glycemic eating. Our typical American diet consists of oversized meals, rich in sugar and processed carbohydrates, which very quickly end up as excess glucose in the blood stream. Spikes in blood sugar cause our pancreas to pump out insulin, which signals our cells to absorb excess glucose, and prevents them from metabolizing fat. Eventually, our blood glucose levels reach an unhealthy low. Since the brain needs sugar to work properly, food cravings and low energy levels ensue, which often sends us to the nearest drive-through for yet another high glycemic meal. The cycle of glucose spikes and dips starts all over again, ultimately leading to weight gain. The Glycemic Index is a value, using sugar as a reference point, that indicates how quickly food converts into blood sugar after you eat it. Pure sugar, or glucose, scores a 100, whereas spinach and lettuce each score a 0. Jasmine white rice weighs in at 109, and a cup of cornflakes without sugar or milk scores a 92. The goal is to have most of your calories come from foods in the 0-55 range. In general, healthy lower glycemic foods include fresh vegetables, lean proteins, and monounsaturated fats like olive oil, nuts, and avocados. A little higher on the scale but still within acceptable range are certain fresh fruits like berries, apples, and pears. To round out your meal, small amounts of whole grains and legumes should be included in a low glycemic diet. As a rule, refined, processed carbohydrates and sugars score highest on the glycemic index scale, and should be avoided. A low glycemic diet will make a healthier fit for you and your wardrobe. By choosing low glycemic foods, blood glucose elevates at a much slower pace, so less insulin is released from the pancreas. With less insulin around, fewer cells are absorbing glucose, so levels never fall to that suboptimal range. We in turn burn more fat, have improved energy levels, have fewer sugar cravings, and are less hungry. This method of eating is beneficial for everyone from children to the elderly, diabetics to people with high cholesterol, and athletes to overweight individuals seeking to loose weight. The benefits are many, including lower inflammatory markers in the blood stream, reduced incidence of arthrosclerosis or hardening of the arteries, a more efficient immune system, improved energy levels, increased feeling of satiety, and of course, weight loss and weight maintenance. No matter how many fad diets come and go, I believe this one is here to stay. Dr. Linda G. Everett is the founder and medical director of Everett Weightloss and the Center for Medical Weight Loss. Board-certified in Internal Medicine and Age Management Medicine, Dr. Everett has extensive training and experience in bariatric medicine, and is a member of the American Society of Bariatric Physicians. She received her undergraduate degree from Johns Hopkins University and her medical degree from Jefferson Medical College. Dr Everett is on the medical staff of both Christiana Care Health System and Jennersville Regional Hospital. 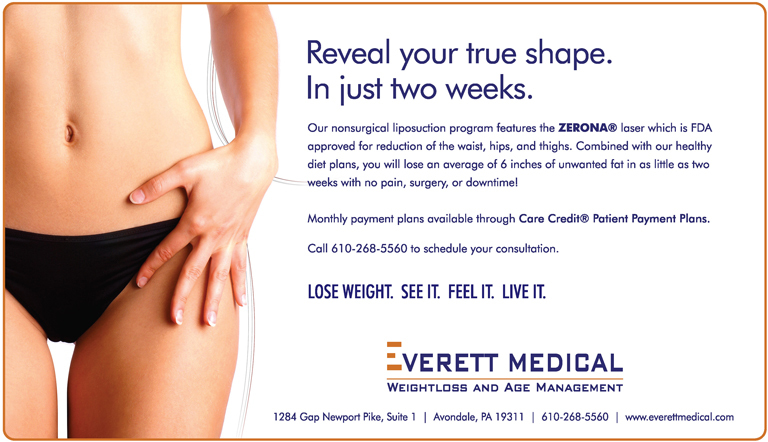 or call 610-268-5560 to schedule a consultation. and is appropriate for all occasions. Not only am I describing the staple color in everyone’s closet, but I also happen to be describing a staple dietary lifestyle always in fashion: low glycemic eating. that indicates how quickly food converts into blood sugar after you eat it. Pure sugar, or glucose, scores a 100, whereas spinach and lettuce each score a 0. Jasmine white rice weighs in at 109, and a cup of cornflakes without sugar or milk scores a 92. The goal is to have most of your calories come from foods in the 0-55 range. In general, healthy lower glycemic foods include fresh vegetables, lean proteins, and monounsaturated fats like olive oil, nuts, and avocados. A little higher on the scale but still within acceptable range are certain fresh fruits like berries, apples, and pears. To round out your meal, small amounts of whole grains and legumes should be included in a low glycemic diet. As a rule, refined, processed carbohydrates and sugars score highest on the glycemic index scale, and should be avoided. A low glycemic diet will make a healthier fit for you and your wardrobe. By choosing low glycemic foods, blood glucose elevates at a much slower pace, so less insulin is released from the pancreas. With less insulin around, fewer cells are absorbing glucose, so levels never fall to that suboptimal range. We in turn burn more fat, have improved energy levels, have fewer sugar cravings, and are less hungry. diabetics to people with high cholesterol, and athletes to overweight individuals seeking to loose weight. The benefits are many, including lower inflammatory markers in the blood stream, reduced incidence of arthrosclerosis or hardening of the arteries, a more efficient immune system, improved energy levels, increased feeling of satiety, and of course, weight loss and weight maintenance. No matter how many fad diets come and go, I believe this one is here to stay. That’s why Low Glycemic Eating is the New Black. visit her on the web at www.everettweightloss.com or call 610-268-5560 to schedule a consultation. Next Story → Have You Heard The Latest Buzz?